Well speaking for myself growing up during and just after the war I now we realize they were right. we kids never had it so good. As you will see by the following story this wasn’t always the case. 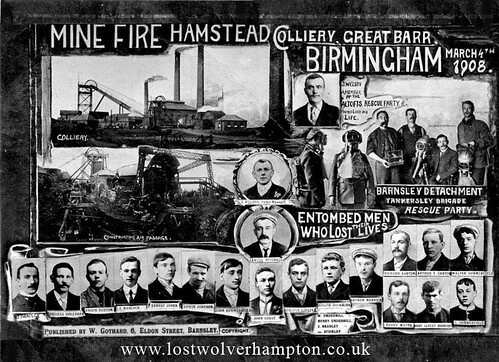 Mine Fire Hamstead Colliery, Great Bar, Birmingham 1908. During its long industrial history the black Country has seen many accidents and disasters, such as this occasion of 4 March 1908 a national tragedy with 26 men killed in one day. When the fire broke out there were 31 miners in the pit, 6 escaped before poisonous fumes built up in the roadways. On the 11 March, 14 bodies were recovered, and 6 more were recovered the following day. 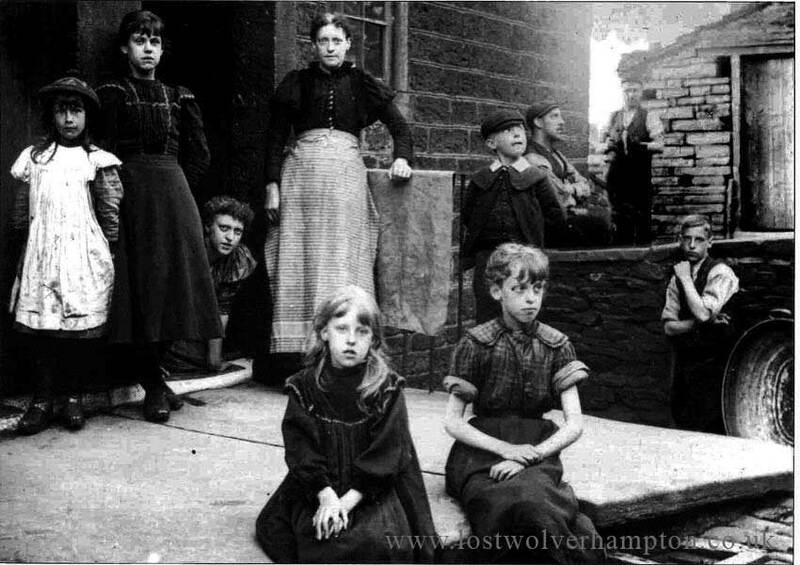 Of all, these industrial disasters though surely the most gruesome occurred at Dudley Port, Tipton, in 1922, when 19 young girls between thirteen and fifteen died in an explosion. 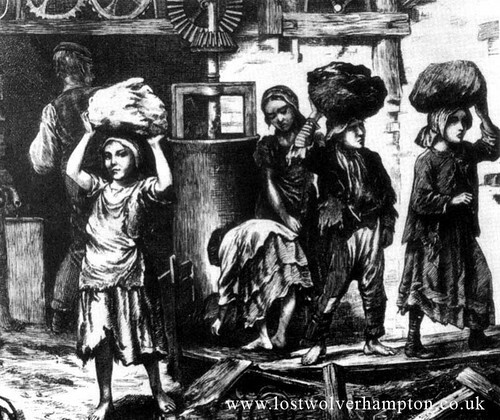 Child labour had been a familiar feature of the Victorian midlands and although legal regulations of child employment had improved conditions in the mining and textile industries, plenty of trades remained unaffected even during and just after the 1st World War. One such case of child exploitation with terrible consequences took place at a small factory tucked away in Groveland Road, off Dudley Port.and one of the unfortunate girls, caught up in what would be later known as, Tipton’s most terrible tragedy, was my mothers cousin , Annie Naylor. Annie who was just 14 at the time was the daughter of Sarah Naylor nee Stevens my Grandfather’s sister. 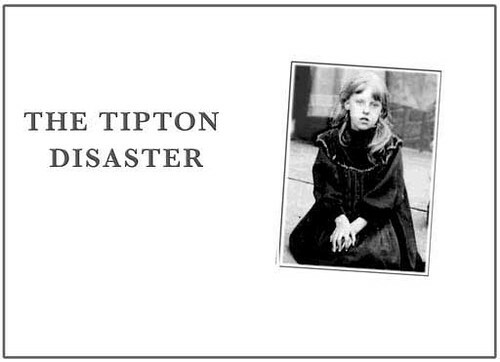 This is my mothers account of the Tipton Disaster in 1922. Around 1916, one John Knowles started a business in a small factory situated in Groveland Road, off Dudley Port Tipton. He named it, the Dudley Port, Phosphor Bronze Co. In 1922 , this company bought 160 tons of cartridges left over from the great war , in order to recover the lead by separating the lead bullet from the copper casing. The work of separation was carried out by a number of young girls in their early teens, employed by the company at a wage of about four to six shillings a week. The girls emptied directly on to the floor gunpowder from the cartridges. this was occasionally swept up , dampened and deposited into the nearby canal basin. The morning of 6 March, 1922, was much the same as any other morning , yet events which were to overtake it, were to leave a sense of shock and horror in local people’s minds for years to come. At about 11.45 a.m. a terrific blast shook the Dudley Port area, for an explosion had occurred at Knowle’s factory. It seems that a spark from an open fire, or brazier within the building, had ignited the gunpowder. The resulting explosion had blown the roof clean off, and the scene was a raging inferno. Young girls were seen running wildly around the yard, screaming insanely; some stark naked, their arms and legs were scorched black; hair and eyebrows burnt. Reminiscent of a scene from the war. 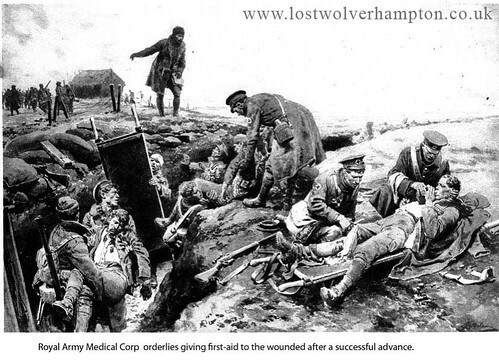 Vivid eye witness descriptions of the scenes after the explosion are beyond conception., even men who had experienced the horrors of trench warfare in France had been sickened by it. A witness, Sam Morgan, of 18 court, number 4 house, Dudley Port, who was coal picking nearby at the time, said, that when he heard the explosion he fell to the ground, as he had been taught during the war, and after getting up, he saw the sky filled with smoke and heard hysterical screams. He rushed to the scene where he saw the girls. Pitiful creatures, who shouted, “Master, Help,” when they saw him. He called out to others as they arrived on the scene to attend to the girls, covering some of those that were naked with bags and sacks. Passing vehicles were commandeered to take the injured and dying to the Guest Hospital at Dudley, where the staff worked their hearts out, day and night. However, due to the intensity and the degree of burns, one by one the unfortunate girls succumbed to their injuries until only a handful were left. The final death toll would reach nineteen. Such was the impact on the public that for forty-eight hours afterwards hundreds of people milled around the scene. The aftermath had left the Factory Building without a roof. The windows had gone , whilst the walls were scarred and black. 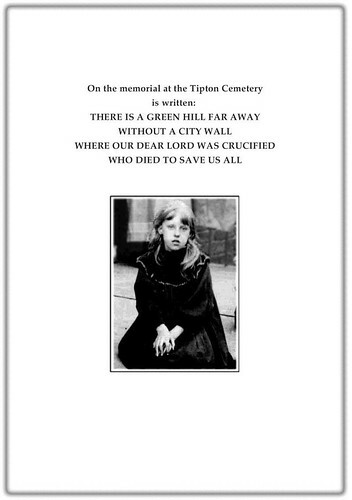 Tiptonians at the time expressed feelings of horror which overshadowed those experienced by the Zeppelin raids on the town some six years earlier. Financial help to the bereaved parents was soon forthcoming, and a relief fund was set up, to pay for funerals and so on. Concerts were held football matches were staged, and all the local industries donated. This monument stands today in Tipton Cemetery. raised in memory of the nineteen girls who were victims of that terrible disaster. The Eighth name down was my mothers cousin Annie Naylor. 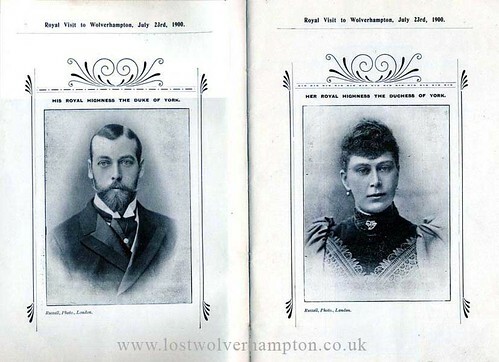 King George and Queen Mary. Evidence of identification was given by members of the families to which the deceased girls belonged in the case of Annie Naylor the gruesome task fell to her aggrieved father William Henry Naylor. Within a short time after the explosion the local police arrested Knowles and his works manager, a fellow named Chadwick. They were charged under the explosive act, and on the evidence, a charge of manslaughter was brought against them. Knowles was found guilty and sentenced to five years penal servitude. Flowered covered Vault at Tipton Cemetery. On the Friday evening, before the funeral of her cousin and eleven of the other girls took place, my mother, who was just 12yrs, traveled with her father to Dudley Port to stay with the Naylors and attend the Funeral next day. 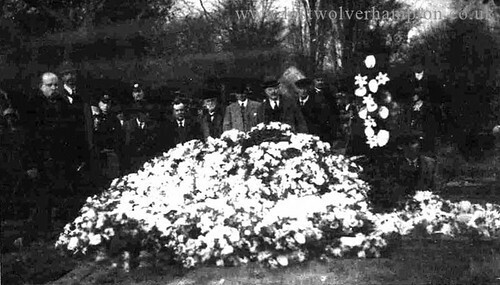 She described the scene to me that day Tipton Cemetery, as she stood with other relatives, and local dignitary’s close to the vast array of floral tributes covering the the grave, were a vault had been acquired for the purpose of a mass burial. She also recalled that when they emerged from the cemetery gates, through the thousands of people gathered there. 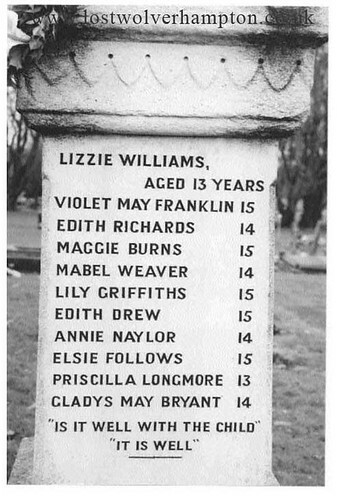 On the bottom of the memorial erected to these girls by the people of Tipton is the children’s favourite hymn. My great aunt was maggie Burns who died in the disaster. My mother has a letter from King George V sent to my great grand mother expressing his sympathy at the tragic loss of life. I have been told that the husband of an ancestor of mine also perished in this explosion. His name was Thomas Harris, his wife was Annie. Does anyone know? My aunt Gladys May Bryant died in this disaster and my grandmother, who had gone to collect her was very badly injured. My grandmother was pregnant with my mum at the time. She didn’t talk about it much but I do have some letters from the time. I would be grateful for any information especially coroners reports and inquests. How do I access them ? I would try the Tipton Library Helen They are sure to be able to help you.